Custom Booths - Energy Compliant Custom Guard Booths | BIG Enterprises Inc. When a major university needed truly custom, energy-compliant guard booths, they turned to B.I.G. Enterprises, Inc. Not only did B.I.G. designs meet California’s strict energy efficiency standards, B.I.G. 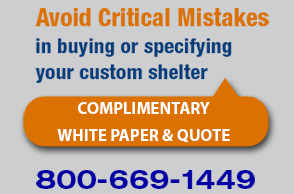 Enterprises is also the only pre-fab guard booth manufacturer to currently meet state of Washington energy conservation standards, which are the most restrictive in the country. The Custom Guard Booths meet all state building and energy codes, comply with ADA access requirements, have high-output HVAC systems, include a restroom and blend in architecturally. The exterior design incorporates overhangs and stainless steel turnbuckles. Wall panels were prepped for a custom finish. The interior has solid surface counters, ergonomically efficient working areas, stylish lighting, and pre-wiring for data and communications systems.